Roasting coffee requires a little more than applying heat to the dried seed of a flowering plant. The mysterious power of heat enables it to produce external, perceptible, even phenomenal results by its own inherent energy. It’s a scientific process; The enchanting charms of this sublime science reveal themselves in all their beauty only to those who have the courage to go deeply into it. Welcome to Code Black Coffee. A dream long in the making for Joseph Haddad and team, Code Black started roasting in October 2012. Code Black is not a single man show. Each member of the roasting team participates in buying, profiling, production and quality control. Because of this, each roaster is invested in and responsible for the operation at every stage of production. While this can make for interesting discussions around the cupping table about what they should buy, it ultimately leads to progression as each of them strive to bring the best they can to the table. 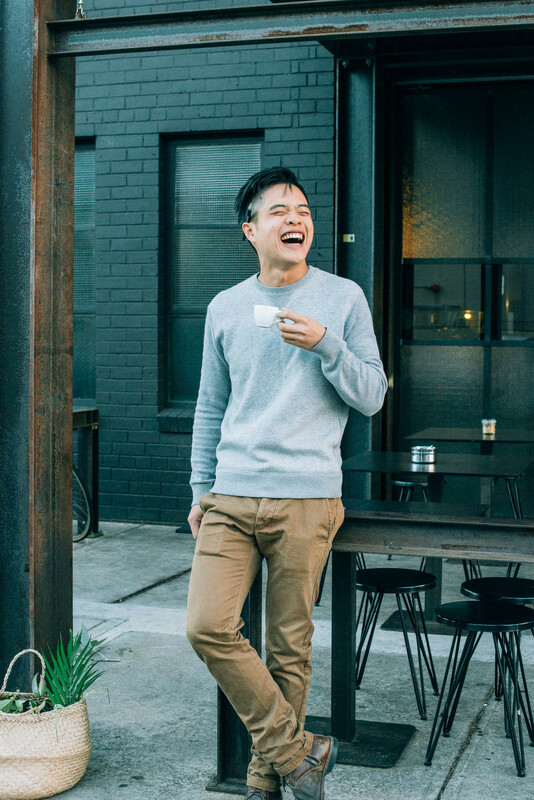 The Roasting team is made up of 4 experienced roasters; Archie Chiu, Allan Yeh, Jacob Milligan, Joe Tynan who roast exclusively on Probats; a 25kg, two 12kgs, a 1kg, a 4 barrel Sample roaster, and a 5kg at their new digs called ‘Howard St’. “We’ve bought this coffee for the past three seasons as it has continued to be amazing” Archie tells us. In December last year their Head Roaster Joe visited the Gelana Abaya region in South Yirgacheffe and came back with stories of the welcoming people, the breathtaking scenery and immaculate processing stations. "Code Black is simultaneously a laboratory, a workshop and a hub for connoisseurs of the dark art and science of coffee." Situated just outside the town of Cheleletu, Gelana Abaya Woreda produces some of the best naturals in Yirgacheffe. Allan tells us that common Yirgacheffe coffee practice is that once picked, it is covered during the peak of the day (11am-3pm). However Gelana Abaya’s methods differ, in that the coffee gets an extended open period in the evening, as late as 11pm. These practises, and the local climate, allow the coffee to be dried carefully for 15-21 days, resulting in unique and distinct flavour. The coffee you’re tasting today has fragrant and floral notes to the grind. With juicy mangoes, raisins, and plentiful passionfruit. It has this buttery body and lingering sugary finish that feels good in the mouth and hugs your tongue. This is a coffee that won best espresso at Golden Bean 2013, and they’ve continued that excellence in the coffee you’re drinking today. Not yet a member? Sign up today. Connect with Code Black on Instagram @CodeBlackCoffee. Vertue? That’s not a spelling mistake. The Vertue of the Coffee Drink takes its name from the first handbill distributed in London in 1652 outlining the medicinal properties of coffee. It is the first recorded evidence of coffee being roasted and sold as medicine. With coffee being a daily drugs for us, this seems fitting. Vertue embodies everything Melbourne. New, unique and of course, hidden away in a laneway. To be exact, it’s off a laneway and off that laneway. Originally horses stables in the 1800s, owner Mike Cracknell has spent the last 2 and a half years building this amazing, perfect space. This freshly minted space has been in operation for 4 weeks but already has Melburnians frothing (yes, pun intended). Amazing creative space? Check. Toys? A beautiful Has Garanti 15kg roaster with custom copper flueing? Check. Doing what you love? Check. Mike comes with almost 2 decades of experience in the industry having tried his hand at almost everything within the hospitality industry. And all that knowledge now goes into every aspect of Vertue. From fit out to experience, food, coffee and service. Why does Vertue coffee taste so damn good? “We have a very simple coffee philosophy: we source the best green bean we can, we roast to bring out the best in the bean and we serve it with care and respect”. Always happy to share his knowledge, Mike finds that there is a lot of hype about coffee these days and that can be confusing and alienating for those not in the industry. To this end, they ensure they are delivering the tastiest coffee without any pretentiousness, whether you’re new to coffee or a seasoned professional. It’s all about the flavour. With that, a focus on filter flavours is what brings us together today. Roasted lightly, Vertue have really given you something special today. It’s a Guatemala Huehuetenango San Jose Obrero (say it five times over). We love using this coffee through a pour over method as it highlights the gentle acidity and bright sweetness. Very juicy and tasty, with pineapple, nectarine, sweet caramels, mandarin and red apple acidity. Essentially, a fruit bowl of deliciousness. The crew at Vertue have also included a sample of the green beans they use to roast your coffee; always interesting to see how the natural bean looks before roasting begins. The Vertue of the Coffee Drink is a pretty special place; uniquely Melbourne and a genuine hidden delight with great coffee and even better service.